After leaving the "GyroStation" you will be in a room with two stairs cases on either side of a large screen. Below the platform with the screen is a ramp that leads downward. Follow the ramp to reach a room where you must use the constellation key to make the pattern on the wall light up. Turn around and follow the ramp downwards to another room where you need to use another constellation key. After both constellations are activated you will receive the "Seeing Symbols" achievements. On the platform with the large tv screen a video will start to play. ("Heat therapy case report" transcripts yet to be created)After this video you will find a game, Glyph Logic, similar to Sudoku. Arrange the tiles on the left into rows, columns and in their correct color space so that no symbol repeats itself in each row or column. After completion of level 5, another video will play "Dad videograph #1", and you will receive the "Making Your Mark" achievement. Once you reach level 9 and 10, the color placements are no longer there and you must play with the pieces to figure out which sections match the others. After completion of level 10, the last video, "Progress or Peril" will play and you will receive the "A Sign Of Character" achievement. Log 01 | Awarded for activating the first constellation in the Command Center. Log 02 | Awarded for activating the first constellation in the Command Center. Log 03 | On the floor, in front of the computer that allows you to view your progress on recent facilities. Log 04 | Awarded for completion of the fifth level of the Glyph puzzle. 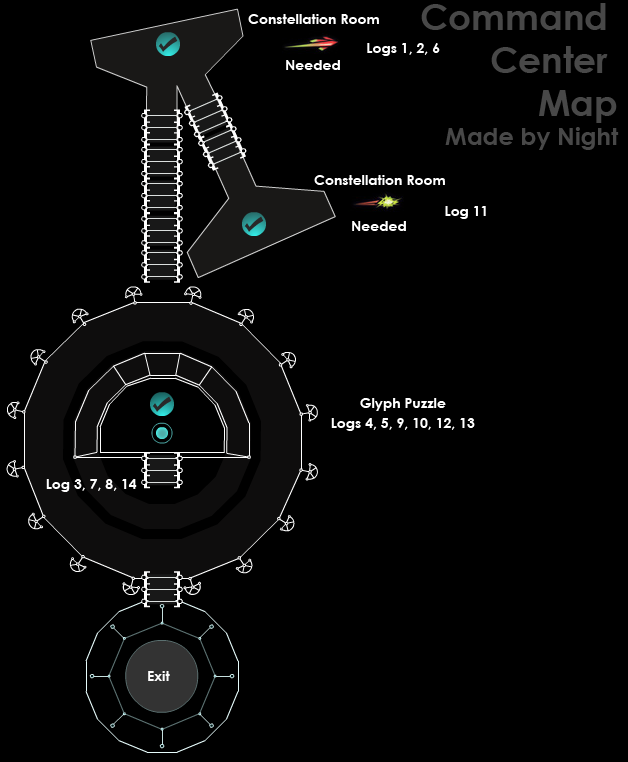 Log 05 | Awarded for completion of all ten levels of the Glyph puzzle. Log 06 | Awarded for activating the first constellation in the Command Center. Log 07 | On the floor, in front of the computer that allows you to view your progress on recent facilities. Log 08 | On the floor, in front of the computer that allows you to view your progress on recent facilities. Log 09 | Awarded for completion of the fifth level of the Glyph puzzle. Log 10 | Awarded for completion of all ten levels of the Glyph puzzle. Log 11 | Awarded for activating the second constellation in the Command Center. Log 12 | Awarded for completion of the fifth level of the Glyph puzzle. Log 13 | Awarded for completion of all ten levels of the Glyph puzzle. Log 14 | On the floor, in front of the computer that allows you to view your progress on recent facilities.